(Nanowerk News) The first experiments are now underway using the world's most powerful X-ray laser, the Linac Coherent Light Source, located at the Department of Energy's SLAC National Accelerator Laboratory. Illuminating objects and processes at unprecedented speed and scale, the LCLS has embarked on groundbreaking research in physics, structural biology, energy science, chemistry and a host of other fields. In early October, researchers from around the globe began traveling to SLAC to get an initial glimpse into how the X-ray laser interacts with atoms and molecules. The LCLS is unique, shining light that can resolve detail the size of atoms at ten billion times the brightness of any other manmade X-ray source. "No one has ever had access to this kind of light before," said LCLS Director Jo Stöhr. "The realization of the LCLS isn't only a huge achievement for SLAC, but an achievement for the global science community. It will allow us to study the atomic world in ways never before possible." Thirty-three LCLS undulator magnets create intense X-ray laser light from a pulse of electrons traveling 99.9999999 percent the speed of light. 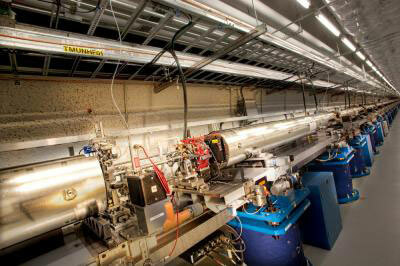 The LCLS is a testament to SLAC's continued leadership in accelerator technology. Over 40 years ago, the laboratory's two-mile linear accelerator, or linac, was built to study the fundamental building blocks of the universe. Now, decades later, this same machine has been revitalized for frontier research underway at the LCLS. After SLAC's linac accelerates very short pulses of electrons to 99.9999999 percent the speed of light, the LCLS takes them through a 100-meter stretch of alternating magnets that force the electrons to slalom back and forth. This motion causes the electrons to emit X-rays, which become synchronized as they interact with the electron pulses over this long slalom course, thereby creating the world's brightest X-ray laser pulse. Each of these laser pulses packs as many as 10 trillion X-ray photons into a bunch that's a mere 100 femtoseconds long—the time it takes light to travel the width of a human hair. Currently, user-assisted commissioning is underway, with researchers conducting experiments using the Atomic, Molecular and Optical science instrument, the first of six planned instruments for the LCLS. In these first AMO experiments, researchers are using X-rays from the LCLS to gain an in-depth understanding of how the ultra-bright beam interacts with matter. Early experiments are already revealing new insights into the fundamentals of atomic physics and have successfully proven the machine's unique capabilities to control and manipulate the underlying properties of atoms and molecules. Earlier this month, researchers used the LCLS's strobe-like pulses to completely strip neon atoms of all their electrons. Researchers also watched for two-photon ionization—an event where two photons pool their energy to eject a single electron from an atom. Normally difficult to observe at X-ray facilities, researchers at the LCLS were able to study these events using the extreme brightness of the laser beam. Future AMO experiments will create stop-action movies of molecules in motion. The LCLS's quick, short, repetitive X-ray bursts enable researchers to take individual photos as molecules move and interact. By stringing together many such images to make a movie, researchers will for the first time have the ability to watch the molecules of life in action, view chemical bonds forming and breaking in real time, and see how materials work on the quantum level. By 2013, all six LCLS scientific instruments will be online and operational, giving researchers unprecedented tools for a broad range of research in material science, medicine, chemistry, energy science, physics, biology and environmental science. "It's hard to overstate how successful these first experiments have been," said AMO Instrument Scientist John Bozek. "We look forward to even better things to come." The Linac Coherent Light Source is a DOE Office of Science-funded project led by SLAC National Accelerator Laboratory. SLAC has executed the project in partnership with Argonne National Laboratory and Lawrence Livermore National Laboratory. In addition, Pacific Northwest National Laboratory provided project management support. Lawrence Berkeley National Laboratory and Cornell University have contributed key subsystems. University of California, Los Angeles has provided theoretical physics support throughout the project; Brookhaven National Laboratory and Los Alamos National Laboratory were active in the early stages of LCLS research and development.